“Traffic just needs to be put in its place, and then this happens”. It’s a Wednesday early evening in the St. George area of Bristol. I’m visiting a street that is part of a national scheme, based in Bristol, called ‘Playing Out’. It’s a simple idea. It supports parents who want to close their street off, for short periods of time, so that children are in charge, not cars. Jo Chesterman, Playing Out co-ordinator for the street I’m visiting, tells me, “We’ve stumbled across a really good thing here”. The pavements are covered with chalk drawings, and kids fly past me on scooters, skateboards and bicycles. There’s skipping going on, two adults turning the rope while a queue of children patiently wait for their turn. [Here is a podcast I made, capturing the event, and speaking to some of the people I met there, some of whom you’ll meet below too]. This street is closed fortnightly between April and October for 2 hours after school, and during the winter, one Sunday every month. Playing Out happens in 500 streets across the country, most notably in Leeds, Hackney, Worthing and North Tyneside, but Bristol is the epicentre, with 60 currently active streets in the city. Playing Out has made the legalities of closing a street a lot simpler. Groups apply with a year’s worth of dates in one go, rather than having to make a series of separate invitations. Playing in the street, the “really good thing” Jo and her neighbours stumbled across, has many benefits. Children need to play, it’s vital for their physical and emotional development. 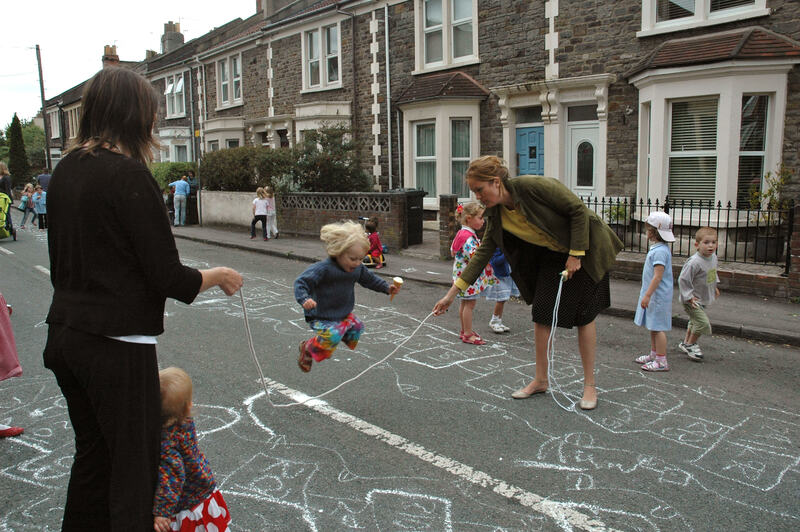 Playing in the street offers kids a blank canvas, unlike computer games where you move through levels of someone else’s devising, playing in the streets allows play that is free, spontaneous, inventive. It is, to state the blindly obvious, on the family’s doorstep. It doesn’t require walks, or drives, to parks or playgrounds. It brings communities together, enabling the residents of a street to meet each other, to build connections which increase the social resilience, but also the safety of a neighbourhood. Playing in the street allows for play that is ‘semi-supervised’. Kids feel safe, they know someone is watching them, and adults get to get some things done, knowing that the kids are being watched. As Jo told me, “The other night, Leah called for Flo, and she went off for an hour, and George was out the front playing football with his mate. I was in the kitchen cooking tea, uninterrupted, knowing my kids were perfectly happy – absolutely brilliant”. Street play gives kids confidence. Playing in the street, being out of the house, is the first step towards feeling more confident about interacting with others. They might then feel more confident about walking further afield, such as walking to school. And lastly, as Playing Out put it, “streets constitute the vast majority of public space in a city”. Visit other parts of the world, and you’ll see streets as places for play, conversation, chess, dominoes, singing and dancing, sleeping. But this can only happen when we take them back. As Jo told me, this approach is “not anti car, it’s pro-community”. Hapgood street. Photo credit: Playing Out. The seeds for Playing Out on the street I visited were sown during the Jubilee when a street party was held, and people found that they were surprised just how many kids there were on the street, and at how much fun they had in the blocked-off street. Jo now acts as a local ‘activator’, supporting other streets who want to do the same. According to Jo, she is now starting to see a change in the culture on the street, a change in how the kids approach play. Before, the kids rarely ever played in the street. Now, she says, it is starting to happen outside of the Playing Out sessions. “Natural street play has started to emerge”, she told me. It’s also great for the adults, who have discovered, as one parent told me, “that we actually quite like each other”. There are regular evening socials. As James, a dad on the street told me, “the parents get to meet one another, who might not normally see each other, because often people just stick to themselves, stay in their own houses, but having things like this, it gets all the parents together”. As Louise, a parent from a neighbouring street who brings her kids to play at the Playing Out seesions, “it’s nice to see everyone come out, talk to each other, and not behind a screen”. There was a sense that when the right conditions are created, imagination flourishes. Louise told me that she sees an “imaginative leap” during these sessions. The kids make up games with the chalk on the pavement, and once they’ve tired of skipping, they “don’t just use the skipping rope for skipping”, it becomes the focal point for all kinds of other games too. As Jo puts it, it “gives them the space for imaginative play”. “Traffic just needs to be, for just an hour or two, put in its place, and then this happens. And it happens every single time, every street that I’ve worked with. You shut it off, you create the space, and it happens”. In the same way that land, left to its own devices, will revert to forest, provided it isn’t mowed, sprayed, or grazed, when the space is made, the cars kept out, the right level of hands-off supervision, the sense of being part of a larger community created, then imagination can flourish. It’s not far beneath the surface. We just have to take the pressure of it, give it space to breathe. Playing Out supports people throughout the UK to make their own street a place to play, as part of growing a national movement for children’s right to play out. To find out how you can get involved, visit www.playingout.net. This is not a new concept. When I was a child in the 1960s, lots of streets around Salford were designated ‘Play Streeets’. Of course it’s not a new concept – the point is that it’s something that happens very rarely these days because there is a much greater perceived (or real) danger. I grew up in the 90s and even then, we played out on the streets much more than I see kids doing today.